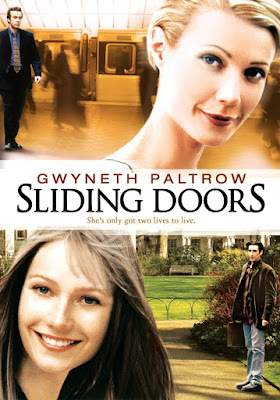 The Rockport Film Review: 1998 The Year of Gwyneth "Sliding Doors"
"Sliding Doors" premiered at the 1998 Sundance Film Festival and got a limited theatrical release in the Spring. Coincidentally Gwyneth's character is named Helen just as in the previously reviewed "Hush", but this Helen has a proper British accent and lives in London. The story is a high concept what if style romantic comedy that asks the question how different would your life be if you made or missed a subway ride home. Helen is fired or "sacked" from her job at a PR firm and while trying to catch the train back home the storyline fractures into two paths. Meanwhile, her wanker of a boyfriend is at home shagging some skag. When Helen catches her ride home she walks in on the unsuspecting couple, what a day. She leaves him and looks to get a new start by getting her long hair chopped off and dyed blond. On the other hand, when she misses her ride she also misses out on a chance to reinvent herself and is stuck in her current life and relationship. Sometimes the bad things in life are actually a blessing is disguise would be the overall message or meaning of the film. The way the filmmakers work with this story structure is well done and thoughtfully put together, although not without its convenient coincidences. It still doesn't have its typical romantic comedy clichés. The new and single Helen starts dating a man who she meets on that train and their ensuing relationship follows a fairly well-known path. The ending is pretty interesting as both timelines end up converging into one. The film also questions fate. If two people are meant to together do it matter what path they take to get there? It's a fun movie that's worth watching as it looks like it has something to say rather than just being a mindless bore like 90% of all other romantic comedies.